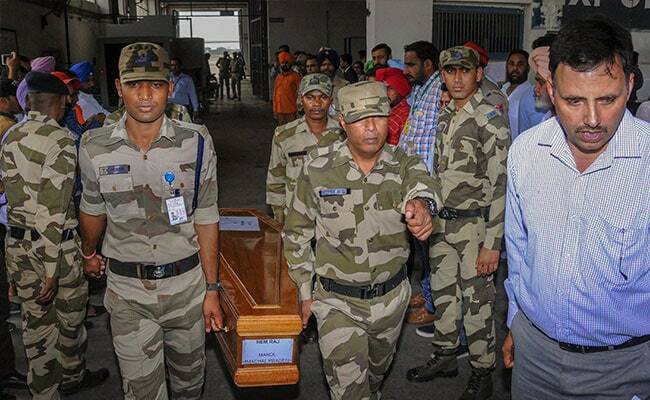 The remains of 31 Indians, who were from Punjab and Himachal Pradesh, were handed over to officials at the Amritsar airport. Asked about jobs for relatives of those killed, VK Singh said "this is not a game of football". Amritsar: Union Minister VK Singh, who brought back today the bodies of 38 Indians killed in Iraq, was criticized for his sharp retort to reporters who questioned him about compensation for the grieving families: "This is not like distributing biscuits." The minister, a former army chief, was speaking to the media at the Amritsar airport, where he arrived by a special C-17 transport plane, accompanying the coffins of the Indians killed in Mosul after they went missing in 2014. "Yeh biscuit baantne wala kaam nahi hai, ye aadmiyon ki zindagi ka sawal hai, aa gayi baat samajh mein? Main abhi elaan kahan se karoon? Jeb mein koi pitaara thodi rakha hua hai (This is not like distributing biscuits, this is about the lives of the people. Understand! How do I make the announcement now, I am not carrying anything in my pocket)," General Singh snapped when asked about compensation. On jobs for relatives of the workers, the minister said "this is not a game of football." Soon, he was being accused by rival parties and on social media of "insensitivity". Sushma Swaraj had told parliament last month that the Indians were killed by the ISIS and their death was confirmed after DNA tests on remains dug up in Mosul, with tell-tale signs like kada (bangles), long hair, non-Iraqi shoes and turbans. The remains of 31 Indians, who were from Punjab and Himachal Pradesh, were handed over to officials at the Amritsar airport. The rest were from Bihar and West Bengal. The remains of the 39th worker have not been brought back as DNA tests have not been conclusive.